Throughout King Solomon’s proverbs, the theme of wisdom, coupled with prudence and justice, forms the basis for his advice on prosperity and living a rich and joyful life. “If wisdom shall enter thy heart, and knowledge please thy soul,“ he says in Proverbs 2:10-11, “ Counsel shall keep thee and prudence shall preserve thee.” Given the mixed messages about the state of the current housing market, it can be difficult to make wise decisions about investing in income property. But for new and veteran investors alike, wise investing means taking advantage of current mortgage lending conditions, which in some key ways favor investors more than residential homebuyers. Some aspects of applying for a mortgage hold true whether a buyer is seeking a residential home loan or financing for income properties, such as income and credit information. But lenders also consider other factors related to how the property will be used and existing conditions there in deciding whether to approve an investment mortgage. Applicants for residential mortgages typically have to provide proof of income, with the debt to income ratio a major factor in getting approval. But for investors, income verification means not just a buyer’s own income, but also the income-generating potential of the property itself – and some lenders may not ask to see a potential buyer’s personal income documentation at all. If the property is occupied, a potential buyer may be asked to show rental receipts, net income statements and any income tax documents that reflect the property’s use as an investment. As everyone knows, residential home loans require a down payment that depends on factors such as the overall cost of the property and requirements specified by the loan originator or servicers. But investors may not be required to put a down payment on property intended for investment, because the property itself secures the loan. What’s more, properties with tenants in place present a better credit risk than a vacant property that needs work to realize its potential. With tenants in place on the property, lenders have reasonable assurances that the buyer can meet the payments on the loan. 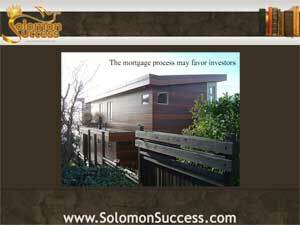 Certain lenders are more willing to handle investment mortgages than others. FHA loans, with their more lenient lending criteria, are available only for residential mortgages, as are some loans offered by other government entities such as Fannie Mae. Refinancing, too, may not available to investors from all lenders; for refinancing options the income property investor may need to shop around for rates and terms.